Research work was, and continues to be for almost twelve years now, one of my main professional accomplishments. Its roots in me were laid from 1985 onwards at the University of Trier, where I earned my Diplom in Business Administration and where the course requirements included writing and presenting seminar papers and group reports. Back in Pakistan after graduation, in Spring 1992, an associate who was managing a consulting firm in Islamabad, advised me to write articles for the Pakistani weekly magazine "The Globe". 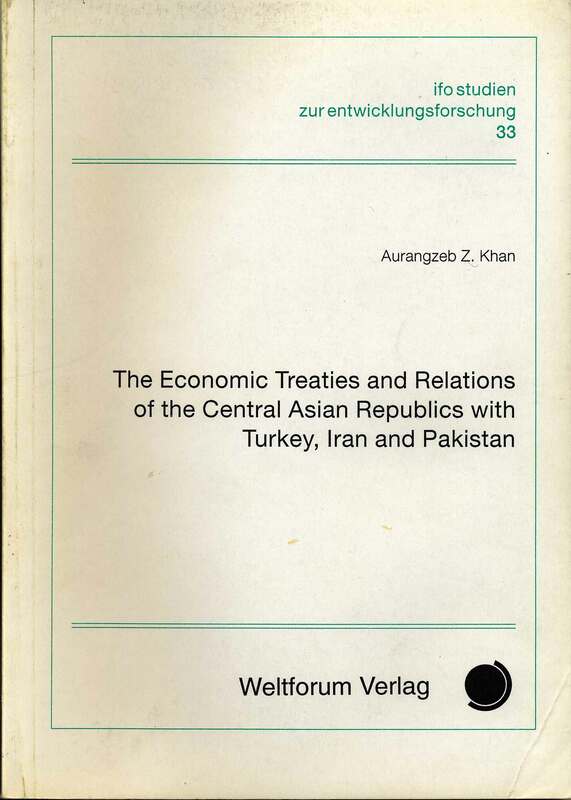 Back in those days, there was considerable excitement in Pakistan about the Central Asian Republics and Azerbaijan, who had recently become independant following the Soviet Union's disintegration. 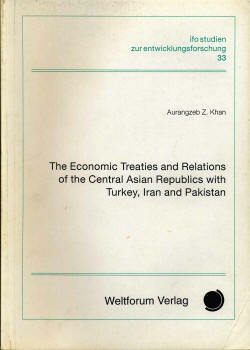 With the emergence of these Republics, many in Pakistan, including its autocratic leadership, wasted no time to harp on the Muslim identity of these fledgling states in the expectation of grand new opportunities for Pakistani industry and Central Asian support to Pakistan against its traditional nemesis India (off course, like with so many other utopian notions in the past, these grandiose plans soon collapsed under the weight of reality). At first I was somewhat reluctant to start writing but, as Central Asia was the buzzword of the times, I decided to give writing a try and apply my then comparatively nascent research skills to investigate and publicize the potential for economic interaction between Pakistan and these fledgling Republics. At worst I really had nothing to lose except my time and energy, of which I had plenty in those days, and at best, I could make a name for myself. After I joined the Hanns-Seidel Foundation early in 1993, my research on this subject continued, but with a somewhat expanded scope which also included Turkey and Iran als key players. In addition to this, I was encouraged to expand the focus of my research by looking into prospects for expanding economic interaction in South Asia, a vast region of over a billion people encompassing India, Pakistan, Bangladesh, Sri Lanka, Nepal, Bhutan and the Maldive Islands. These countries are members of the South Asian Association for Regional Cooperation. The fundamental underlying concept behind all my research here was "confidence-building" between the region's two key players, India and Pakistan. What this meant - at least in theory - was that expanding economic interaction (trade, investment, energy) between India and Pakistan would reduce the bilateral tensions, which have persevered since the partition of India in August 1947 and climaxed in three wars, and this would in turn result over time in a reduction of defence spending and massive reallocation of productive resources where countries as poor as India and Pakistan should be investing them in the first place, namely, in providing adquate health, housing, water, sanitation, education and employment to their multitudes of destitute citizens. Many bilateral confidence-building initiatives, dubbed "Track-II Diplomacy" were pursued by a number of well-intentioned and reputed individuals from both India and Pakistan in the mid-to-late 1990s, and foreign organizations had lent considerable logistical support for this purpose. 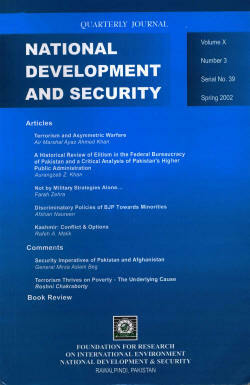 In 1993-1997 and 2002 several of my articles on the theme of India-Pakistan "economic confidence-building measures" were published by reputed research organizations - The Institute of Strategic Studies, Islamabad, where I worked as a Research Fellow, the Henry L. Stimson Center in Washington D.C., which advises the US government on policy matters relating to South Asia, the Area Study for Europe at the University of Karachi, with which I coorganized two international seminars in my capacity as the Hanns-Seidel Foundation's Programme Coordinator, and the Foundation for Research on International Environ-ment, National Development and Security, which is a Pakistani non-governmental organization and partner of the Hanns-Seidel Foundation, and with which I also coorganized a number of international conferences, seminars and workshops. My research for the Stimson Center, in which I proposed a common electrical power grid system for India and Pakistan, as well as a comprehensive programme of Indo-Pakistan cooperation in trade, joint ventures and science and technology was, in particular, received with acclaim in policy making circles in the region. Ever since, I have noted demands for such schemes (particularly the energy scheme) to be pursued have appeared several times in the newspaper, schemes which even the US Government has publicly endorsed. With the advent of the new millenium the focus of my research shifted away from economic interaction in Central and Southern Asia and redirected itself towards the field of public administration as I enrolled in the master and subsequently the doctoral programme in public administration at the German University of Administrative Sciences Speyer from Winter Semester 1998. My mentor in Speyer and the supervisor of both my masters and doctoral thesis', Professor Dr. Rainer Pitschas, was keen to learn about the system of public administration in Pakistan, of which I myself admittedly knew very little at the time, but which I took on with my usual committment and untiring investment of time and mental as well as physical energy. I vividly remember sitting alone for hours in the university's basement computer lab in those last dark and cold days of December 1998, when everyone had fled Speyer for the Christmas/New Year holidays, typing away at my research paper entitled "A Historical Review of Elitism in the Federal Bureaucracy of Pakistan and a Critical Analsis of Pakistan's Higher Public Administration" which I first wrote in English and then translated into German for presentation at the class seminar on comparative public administrations in January 1999. It was a very gruelling but ultimately immensely satisfying experience and my research was, with a few modifications, subsequently published in Pakistan in 2002. I had enrolled at the German University of Administrative Sciences in Speyer with a specific field of research interest in mind: Crime Control. I devoted every opportunity to undertake extensive research into this field. I produced the unpublished paper "International Cooperation in Combatting Crime" for another seminar which I attended in the winter semester 1999/2000, and which was my final semester in the masters of public administration programme. It climaxed in writing a thesis of approximately 40-50 pages over the prescribed six week period with the title "Crime Prevention in the European Union with Special Reference to Crime Prevention Measures in the Federal Republic of Germany" The theme was chosen by my soon-to-be main doctoral supervisor, Professor Rainer Pitschas, who was aware of my research interest and supervised my thesis together with another Professor. I commenced my work at the end of January 2000 and it lasted until about mid-March. During this time, my appartment looked as if a cyclone had ripped through it! Books and piles of documents were strewn about on the floor and I worked for the six weeks without a day's rest in between! My daily sleep ration amounted to about 6 hours, down from the 9 hours or so I was traditionally accustomed to. Be assured that writing a scientific thesis in a foreign language (in this case German) can be a daunting challenge indeed, even if the student happens to know the language in question very well which, fortunately, I do. Given the six-week time constraint and the fact that I had to earn at least grade "good" in order to qualify for enrollment in the doctoral programme, I felt under tremendous pressure the entire time! Moreover, each supervising Professor must grade the thesis individually, and the final grade is based on the average of their marks. Then, six weeks after thesis submission, students must attend an oral examination presided over by three Professors, including the main supervisor. I was really stretched to the limit by some of their wierd questions but, ultimately, I qualified the programme with the good grade I needed. And, to my great satisfaction, my thesis was reprinted in its entirety in the German quarterly police magazine "Die Kriminalpolizei" in five parts from the 4th quarter 2000 to the 1st quarter 2002. I enrolled in the doctoral programme in public administration in Summer 2000. By this time I had largely recovered from the enormous physical and mental stress of the master programme. 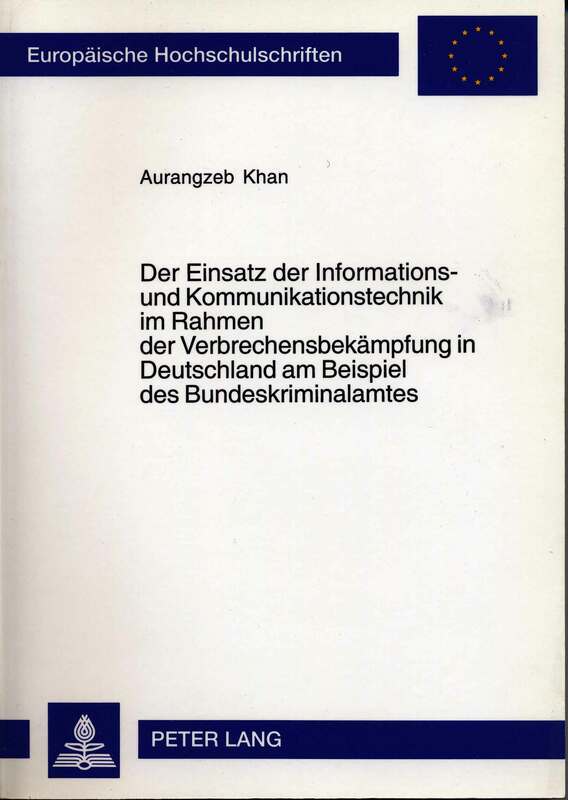 My thesis, on a subject of great significance for practical criminal policing, had as its title "The Application of Information and Communication Technology in Combatting Crime in the Federal Republic of Germany: The Example of the Bundeskriminalamt". Little was I to know that the immense challenge it posed for me - would be profoundly influenced by the tragic events of September 11, 2001. 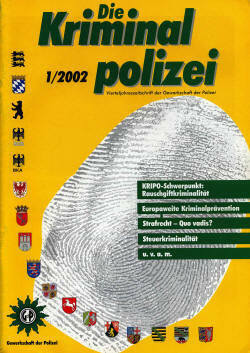 Prior to this event, my primary information sources (the German police agencies) adopted a "cautiously cooperative" behaviour towards me but thereafter, and probably out of apprehension of their "secrets" may fall into the wrong hands if exposed in a publication, they became noticeably reluctant to share data and information with me. Off course, this change in attitude made my work, which because of its nature was already difficult, even more difficult. However, through some innovative methods on my side and use of my contacts in the German police service, as well as my determination to travel hundreds of kilometres to distant towns for interviews with senior police officials, I was able to collect most of the information I needed for producing my thesis. I submitted it to the university on the third anniversary of my enrollment in its doctoral programme which, incidentally, is the last day for submission. The remaining formalities included evaluation of the thesis by my supervisor, Professor Pitschas, and my co-supervisor Professor Dr. Waldemar Schreckenberger, preparing for the mandatory oral examination (Rigorosum), in which my supervisor, co-supervisor and Professor Dieter Duwendaag quizzed me for an hour, and preparing the thesis for publication by a reputed publishing house. Completion of these formalities took another 15 months. Preparing for the Rigorosum and formatting my thesis and its numerous tables and diagrams into a form suitable for publication sure was an exhausting but necessary task. My thesis - the crown of all my research accomplishments - appeared in print in August 2004. It is considered to be the most comprehensive and authoritative public research work on information technology in the German Federal Criminal Police Office (Bundeskriminalamt). Other research on the subject tends to focus either on very specific or very general issues. My thesis covers it all and I'm proud that I have stood up to such an awesome challenge! Since the publication of my thesis, and republication of a section of it in a monograph published by my co-supervisor, I have not brought out any new research. My research interest has shifted yet again, this time from crime control to project management, which I teach every semester at the COMSATS Institute of Information Technology. Presently, I am interested in undertaking research on issues relating to project management and total quality management (specifically with reference to Pakistan) in collaboration with major international organizations, such as the World Bank and Asian Development Bank, and will be making enquiries in this regard soon. When my office schedule permit, my pen will busily get down to work on its next research project again. My more recent research publications can be downloaded as pdf-documents below. I will soon post my earlier essays as well (that is, after I found them. I think they're buried deep in one of several book trunks in my storeroom). Please feel free to download them by clicking on the links. To see the enlarged versions of the publication covers, click on the images. Published by the Henry L. Stimson Center in Washington D.C., USA, in their Occasional Paper 32, February 1997, pp. 37-70. This essay advocates as an "economic confidence-building measure" close and sustained economic integration between India and Pakistan as a strategy for reducing bilateral tension and, ultimately, for reallocating the vast amount of resources both countries spend annually on defence into economic and social development. The focus is on creating an Indo-Pakistan free trade area supplemented by joint ventures and collaboration in the field of science and technology. 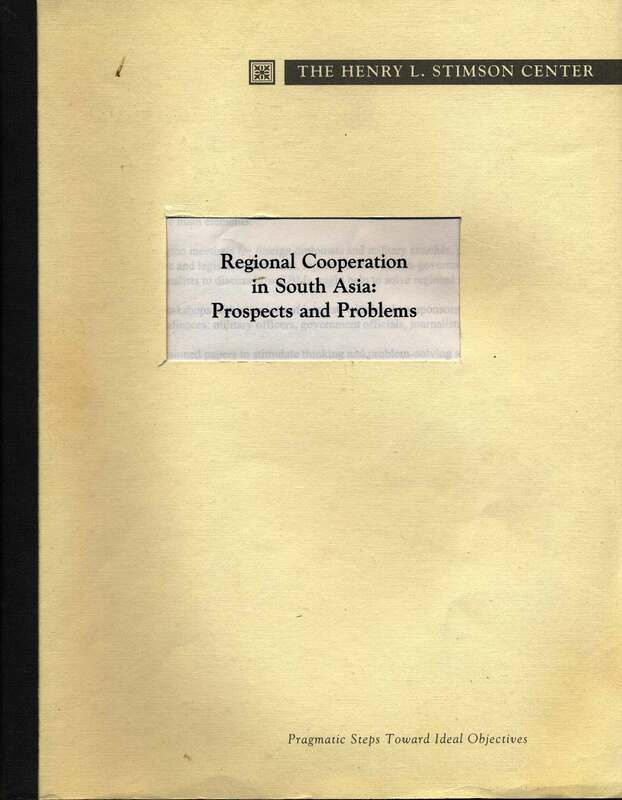 Published by the Henry L. Stimson Center in Washington D.C., USA, in their Occasional Paper 32, February 1997, pp. 73-94. This essay examines, also as an "econonomic confidence-building measure", an innovative concept for promoting confidence-building between India and Pakistan through a joint energy system comprising a region-wide electrical power grid and network of gas pipelines. The analysis extends beyond India and Pakistan to include Tibet, Nepal, Bhutan and the Central Asian Republics and Afghanistan. The work is based on extensive research undertaken by me and hard-to-get data from all countries concerned. Published in Germany by the Weltforum Verlag in the publication series entitled IFO Studien zur Entwicklungsforschung, Number 33, 1998. This monograph examines the prospects for greater economic interaction bewtween the nine member states of the Economic Cooperation Organization. Highlights are the numerous agreements and institutions aimed at increasing trade between the ECO member states and the hurdles to such interaction. The interaction between Turkey, Iran and Pakistan on the one hand, and the Central Asian Republics on the other, in the fields of trade, investment and physical infrastructure is also examined and several practical measures for intensifying interaction between the ECO member states are proposed. THE EUROPEAN UNION: A MODEL FOR REGIONAL INTEGRATION IN SOUTH ASIA? 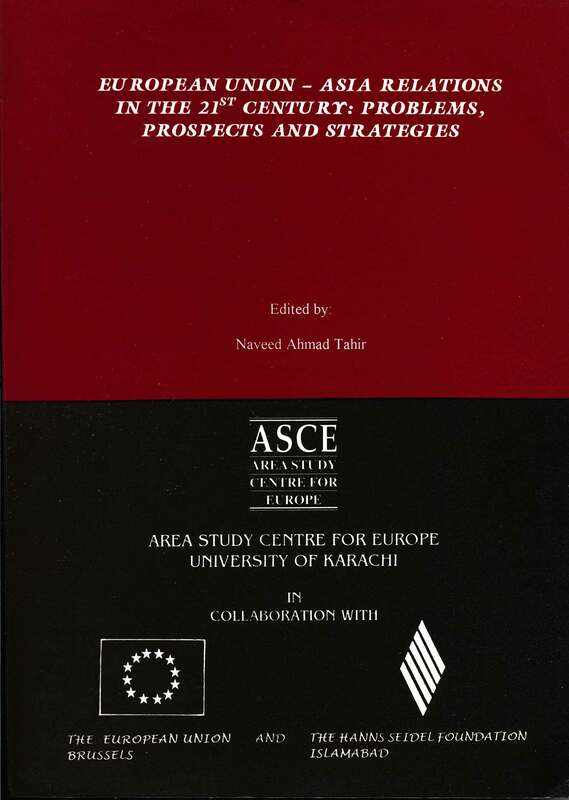 Published by the University of Karachi's Area Study Centre for Europe in the book edited by Naveed Ahmad Tahir entitled "European Union - Asia Relations in the 21st Century: Problems, Prospects and Strategies", B.C.C. 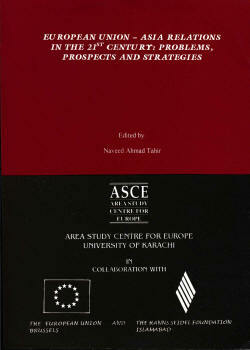 & T. Press, University of Karachi, September 2001, pp. 92-115. The esaay examines the viability of the European Union as a "role model" for integration in South Asia. It details the European Union's aims, agenda and institutional structures and then discusses the potential benefits of and existing hurdles to similar economic, social and political integrative paradigms in South Asia. Finally, it proposes several practical measures to facilitate integration between South Asian states. The Area Study Centre for Europe at the University of Karachi does not have a website. 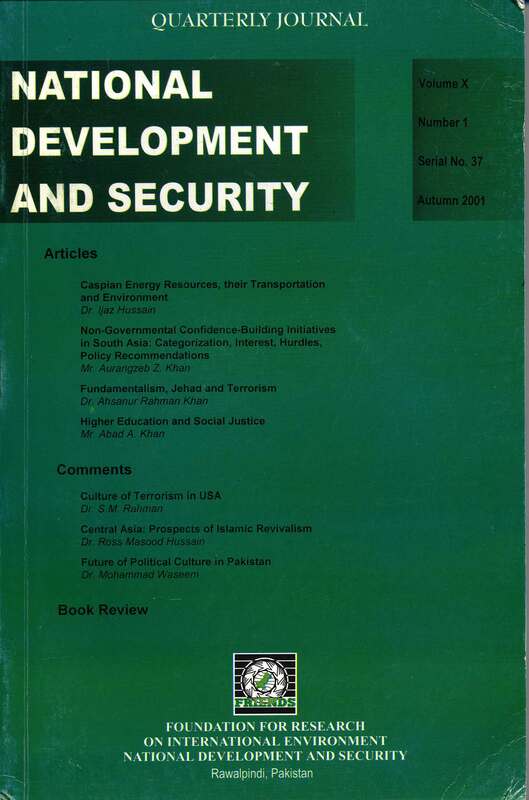 Published in "National Development and Security", Quarterly Journal of the Foundation for Research on International Environment, National Development and Security (FRIENDS), Volume X, Number 1, Serial Number 37, Autumn 2001, Rawalpindi, pp. 20-41. This essay examines five issues relating to efforts to reduce tensions in South Asia, and specifically between India and Pakistan, through non-governmental confidence-building initiatives. 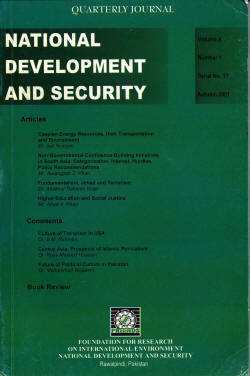 It looks at the concept of confidence-building, identifies two basic categories of confidence-building initiatives and the reasons for the increased interest by the non-governmental sector in the confidence-building process in South Asia, and conducts an impact assessment of and reviews the prevailing hurdles to confidence-building. Finally, the essay proposes several recommendations for enhancing the non-governmental sector's role in the confidence-building process. 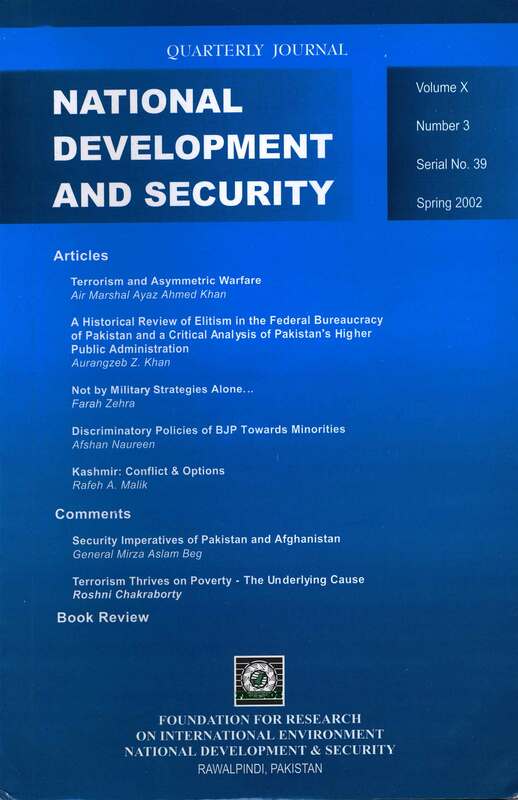 Published in "National Development and Security", Quarterly Journal of the Foundation for Research on International Environment, National Development and Security (FRIENDS), Volume X, Number 3, Serial Number 39, Spring 2002, Rawalpindi, pp. 18-66. Ths essay examines the origination and development of elitism in the Bureaucracy of Pakistan from the British colonial era to the present day. It reviews the Civil Service of Pakistan as the corps d'elite of the central bureaucracy, the civil service reform programme of 1973, and the subsequent development of the civil service under succesuve Pakistani military and civilian regimes. It highlights specific problem areas confronting the higher bureaucracy - politicization, corruption and inefficiency - and concludes with a few practical policy suggestions. 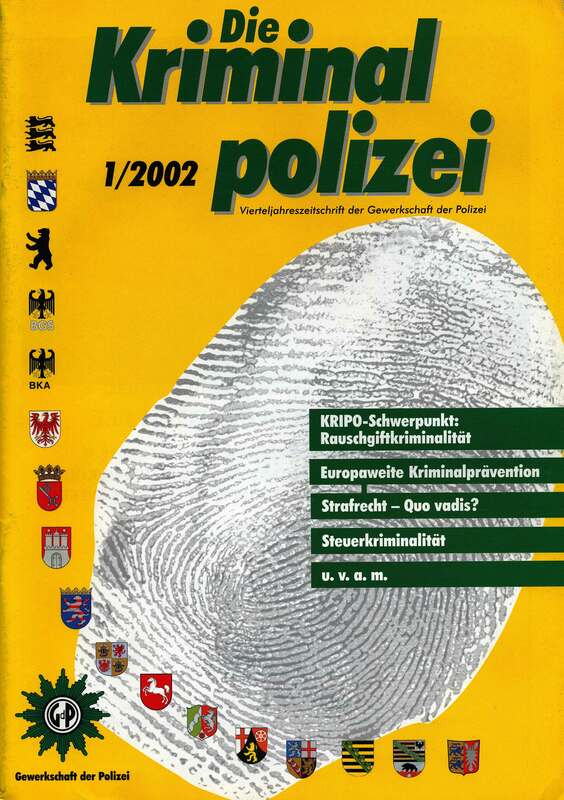 Published in the quarterly magazine of the German police magazine "Die Kriminalpolizei" in six parts (4th quarter of 2000 to the 1st quarter of 2002). This essay is a complete reprint of my masters thesis on crime prevention in the European Union with special reference to crime prevention measures in Germany, which was submitted to the German University of Administrative Sciences Speyer in March 2000. It introduces the theme of crime prevention and critically examines crime prevention measures undertaken in Germany by different states and local governments, as well as in the selected European Union member states France, Great Britain and the Netherlands. It goes on to discuss crime prevention in the context of law and its deterrance effect. Published in the book "Auf dem Weg in einen "neuen Rechtsstaat". Zur künftigen Architektur der inneren Sicherheit in Deutschland und Österreich", edited by Professor Rainer Pitschas and Professor Harald Stolzlechner, Schriftenreihe der Hochschule Speyer, Band 160, Duncker & Humblot, Berlin et. al., 2005, pp. 127-130. My brief three-page statement, presented at a workshop which was held at the German University of Administrative Sciences Speyer on October 14th-15th, 2002, on challenges facing law enforcement agencies in Germany and its legal/constitutional ramifications in the post-9/11 era, concerns the role of the "Rasterfahndung" as a tool for preventing serious crimes in Germany. The Rasterfahndung, which has been used by German law enforcement agencies for decades, is a focussed but legally quite controversial technique which uses computerized databases in both the public- and private-sectors to help in the location and apprehension of criminal or terrorist suspects on the basis of certain physical or behavioural characteristics they exhibit. The controversy surrounding the Rasterfahndung centers on its cost in terms of violation of the privacy of a large number of people by the state for benefits which are, at best, uncertain. Download this statement as a pdf-document here (note that the statement is in German). To visit the Website of the Duncker & Humblot publishing house click here. 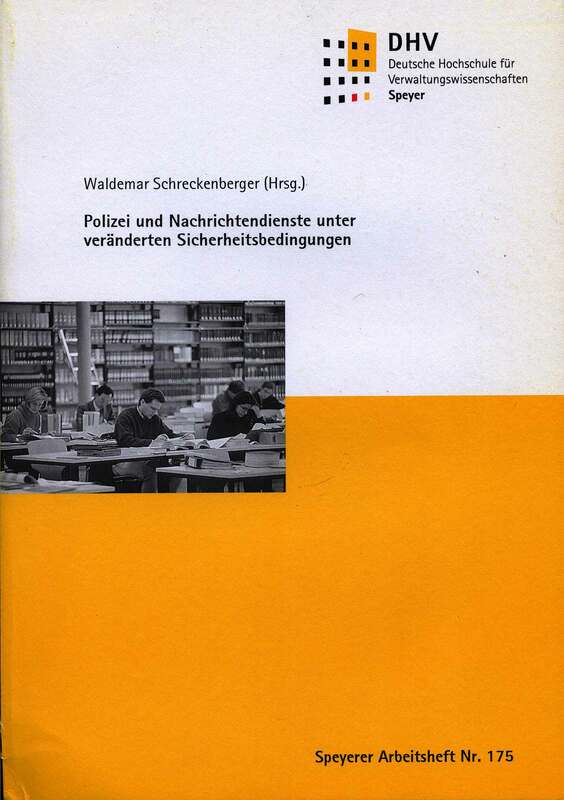 Published in the Speyerer Arbeitsheft 175, edited by Professor Dr. Waldemar Schreckeberger, and entitled "Polizei und Nachrichtendienste unter veränderten Sicherheitsbedingungen: Vorträge und Abhandlungen über die Sicherheitsaufgaben des Bundes der Bundesrepublik Deutschland", German University of Administrative Sciences Speyer, 2005, pp. 29-57. This essay is a reprint of a section of my doctoral thesis (see below). It briefly describes the objectives and structure of the main agencies working for law enforcement at the federal level in Germany (Bundeskriminalamt, Bundesgrenzschutz, Zollkriminalamt, Bundesverfassungs-schutz, Bundesnachrichtendienst) and their counterparts at the level of the sixteen individual states. The punblication includes contributions by the Directors of two of the mentioned federal agencies. 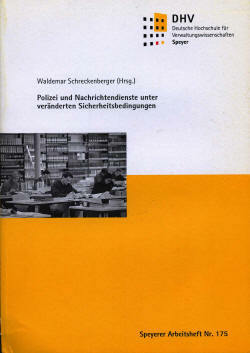 Published by Peter Lang Verlag in Europäische Hochschulschriften, Reihe V (Volks- und Betriebswirtschaft), Band 3093, Frankfurt am Main et. al., 2004. The book has 422 pages and includes numerous tables, diagrams and an organigram. 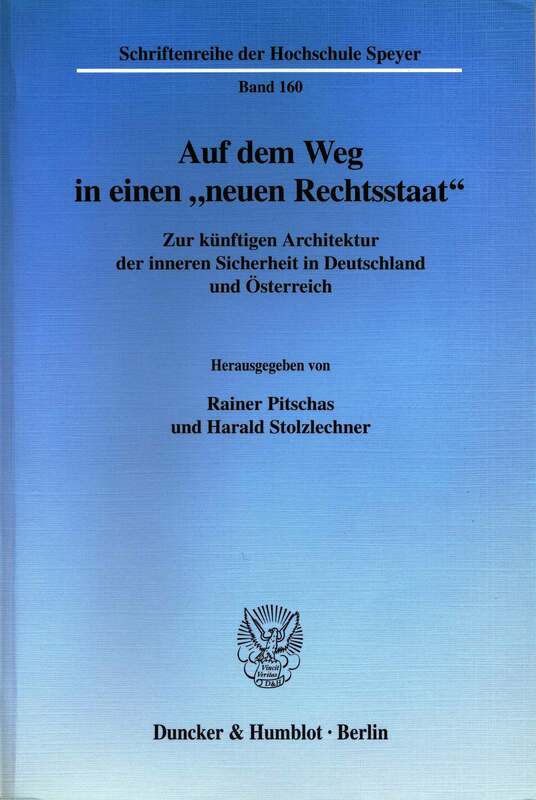 This book, which was my doctoral thesis at the German University of Administrative Sciences in Speyer, is the crown of my research work to date. 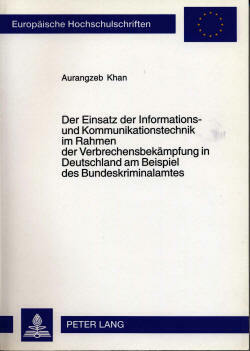 The product of three years of extensive, back-breaking research under difficult circumstances, this book is the most authoritative research to date on the information and communication technological infrastructure of the German Bundeskriminalamt, which is that country's version of the American Federal Bureau of Investigation. The book comprehensively examines the Bundeskriminalamt's information systems, notably its acclaimed INPOL database, its Automated Fingerprint Identification system AFIS, its DNA and Violent Crime Analysis Linkage System (ViCLAS), and its very close links to the international police organization INTERPOL, the European police agency EUROPOL and the Schengen Information System. The book also looks, among other themes, at the law which governs the activities of the Bundeskriminalamt, privacy issues and the structure of the German law enforcement system. Due to copyright law, I cannot post the entire book in pdf-form on this page, but its Table of Contents can be downloaded here. To visit the website of Peter Lang Verlag click here. If you have any critical or favourable comments and constructive suggestions about this page, please eMail me or sign my guestbook.